WeatherTech® Company, the famous maker of auto floor mats and other accessories has seen extraordinary growth in demand for its made-in-America products. To accommodate its success, WeatherTech had to expand its Bolingbrook, Illinois corporate campus, annexing existing buildings and adding new construction. Its latest expansion to create a state-of-the-art Marketing, Sales and Services center combined an older building with a new addition for over 35,000 square feet of new space. The renovation of the older structure presented some unique challenges, especially when it came to floor preparation. Luckily, WeatherTech has had a long business relationship with PCI FlorTech, its trusted flooring dealer for much of its expanded campus. After consultation with Ron Loffredo, Technical Services Manager at H.B. Fuller Construction Products, PCI FlorTech chose the TEC® brand product line to address the two key issues for the floor preparation: mitigate moisture issues and then level the varying elevations of the patchwork floor. To start the project, the first floor’s surfaces were prepared with LiquiDam™ Penetrating Moisture Vapor Barrier on the existing structure’s floors and LiquiDam EZ™ Moisture Vapor Barrier on the new construction concrete. Innovative LiquiDam EZ allowed PCI FlorTech to eliminate applying primer in most of the new areas. 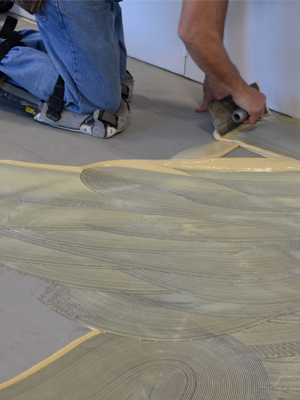 TEC® Level Set® 300 is high-performance self-leveling underlayment that creates a flat, extremely smooth and durable surface for new flooring – in this case Centaur recycled rubber. The TEC self-leveling product is walkable in just 2-3 hours which took some time pressure out of the tight flooring schedule. Newly introduced TEC® TrowelFast™ Flooring Adhesive was used to adhere the rubber flooring in the high traffic areas of the building. This user-friendly innovation saves installation time compared to traditional urethane wet set adhesives. Its unique formulation dries quickly, has a long open time, and provides excellent resistance to moisture. In Memoriam: Mike O’Connell President of PCI FlorTech passed away too soon in August, 2017. He was an outstanding partner to his employees, his vendors including H.B. Fuller Construction Products and his many customers, especially WeatherTech where he enjoyed more than a decade-long relationship. Lauded by the flooring industry and Starnet Worldwide Commercial Flooring Partnership where his company has been a member since 2005, Mike understood the value of integrity, honesty and friendship in business. He is missed by all.